Miami Heat's Dwyane Wade (3) gets off a shot past Orlando Magic's Victor Oladipo (5) during the first half Saturday night. ORLANDO, Fla. (AP) — Rashard Lewis didn’t join the Miami Heat last season with any illusions of expecting to log the minutes he did earlier in his career. That doesn’t mean the veteran forward isn’t capable of contributing quality minutes when the Heat need them. 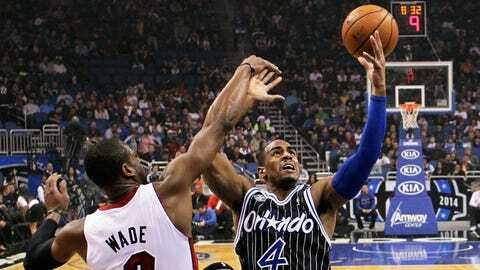 Ken Hornack takes a closer to look at the Magic's home loss to the Heat. Dwyane Wade and Chris Bosh each had 20 points, and Lewis added 18 points in just his second start of the season as the Miami Heat rallied to beat the Orlando Magic 110-94 Saturday night. "We’re a veteran team and I’m used to it after playing last year. You just have to be mentally ready to go when your name is called upon," Lewis said. "With the type of team we have you might play 20 minutes and you might play 5 minutes. You’ve just got to be ready." Lewis started in place of Shane Battier, who sat out to rest a sore quadriceps. He gave quality minutes all night, hitting three 3-pointers. He also had eight points during a third-quarter run, before the Heat’s big three then caught fire in the fourth to secure the victory. LeBron James had 15 points, eight rebounds and eight assists. 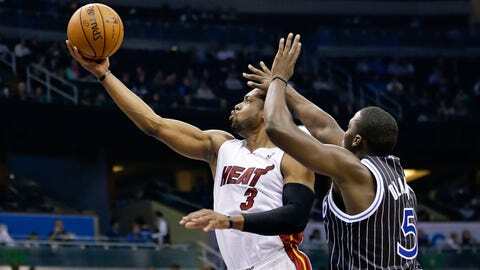 The Heat won their eighth straight over the Magic. It was also Miami’s 22nd consecutive divisional victory, leaving it just one win short of tying Boston’s NBA record of 23 set in 1961. Miami kept its streak going despite James’ 5-for-13 shooting night. 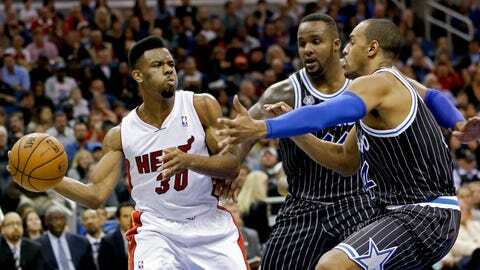 Charlie McCarthy breaks down how the Heat were able to take down the Magic in Orlando. Wade has been pacing himself recently in back-to-back games, but started Saturday. Miami hosts Toronto on Sunday. The Raptors are one of the league’s hottest teams, winning five straight and eight of their last 10. They currently lead the Atlantic Division. Heat coach Erik Spoelstra said it’s something they’re aware of, but nothing they’ll put too much emphasis on. "We’ve been noticing," Spoelstra said. "They’ve been playing very good basketball. We mentioned that about the Eastern Conference. It is way too premature to figure out where teams are. There are teams that have higher ceilings, and they’re one of them." The Magic were without starting center Nik Vucevic, who missed his second straight game with a sprained left ankle. But they managed to stay in the game by spacing the floor and getting some easy layups. They fell apart down the stretch, though, as Miami began to rack up points inside. Jameer Nelson led Orlando with 21 points and Tobias Harris added 17 points and 10 rebounds. The Magic lost their third straight. "They got out in transition and I’m always talking about how offense helps your defense, and we couldn’t get anything going," Magic coach Jacque Vaughn said. The Magic tried to adjust to Vucevic’s absence by shifting Glen Davis to center and inserting Andrew Nicholson in to start at power forward. Nicholson played only six minutes, but was pulled in the first quarter and didn’t return. While Nicholson struggled defensively, Davis took advantage of Battier’s absence and had a lot of early success inside to keep the Magic in it. The Magic clung to a 57-54 lead early in the third quarter before a layup by James ignited a 19-2 Heat run that put Miami back in front 73-59. Lewis had six points during the run, including a four-point play. The Magic never got closer than nine in the fourth quarter. Arron Afflalo, the Magic’s leading scorer, said he hopes a five-game road trip — which begins on Monday — can help him break out of a recent shooting slump. He has shot under 40 percent in each of the Magic’s last three games. "It’s getting back to that point again, we just want to win," he said. "Regardless of any and everything, each and every night, whether it’s this or that — we just want to win." Bosh said he’s excited about his latest matchup against the Raptors. "This is going to be a huge game for them," he said. "We know they have a lot of confidence and have had some big games and big wins on the road. … We are going to have to make sure we let them know what is really important for us at home and what a true champion plays like." NOTES: The Magic dropped to 1-15 when their opponent scores 100 or more points. … The Magic waived reserve big man Solomon Jones following the game. Jones appeared in 11 games this season, averaging 1.3 points and 1.5 rebounds. He was signed by the Magic as a free agent prior to training camp.